Jenna’s hair is fascinating to him, its golden curliness captivating in a way the poker straight and black kind that he has grown up seeing, never was. He wishes his mother had the same kind of hair and then feels guilty. Seated with his knees pressed together and struggling to keep his mind off the all round chatter around him, he is saddened by how the perfection he has always associated with his mother is slowly receding. There are days when he wishes she would, do something about that hairy mole on her cheek, or not talk with her mouth full of vegetables, or just not talk at all. He can feel the guilt returning just after the brief sense of justice that his thoughts generate, fades away. And what makes it worse is that in a many a moment of unguarded absentmindedness, he has to remind himself of her existence some 6000 odd miles away. No, this won’t do, he decides before the guilt would begin to shadow everything else around him, and tries to get his focus back on the golden halo of Jenna’s mane, remembering how he had taken an instant liking to her right from the moment he had seen her stand next to her Ford Expedition on that overcast Sunday morning when she had come down to help him shift into the house on Leonard Street. The house in itself wasn’t bad. He had the smallest of the three bedrooms and he would have to share the bathroom, but he liked the kitchen and the spacious living room where he could imagine himself curled up on the sofa, listening to random FM channels. But long after Jenna had helped him shift his bags inside and he had paid the month’s rent in advance to Mr Suri the landlord, he had stayed inside his room, carefully bolting it from within, staring at the ceiling and thinking of his three Indian flatmates. Raj, one of those flatmates, the only one whose name he can spell clearly, is seated on the last row now, talking to his girl friend on the phone with such intense intimacy that despite not being able to understand a word of that language, he cannot help but feel like an intruder to the conversation. “What did you do over the weekend Johnathan,” Jenna asks him just then, her eyes fixed on his face through the rear mirror, expectant with the promise of a befitting reply. He opens his mouth and closes it almost instantly. What he did over the weekend would hardly be befitting. How would Jenna react if he told her that he had spent most part of his Saturday morning lying down in bed, miserable with a migraine, after which he did manage to wake up, have a aimlessly long shower and a late lunch, following which he walked up to the nearest laundromat and struggled with their unaccustomed-to washing machines before being helped by its smirking fat-mustached and heavily accented Indian proprietor. After getting back home and disposing his clothes back into the closet, he had struggled to get past the first 10 pages of Catcher in the Rye for the n-th time before giving up and falling back on a rerun episode of Seinfield on Youtube, probably dozing off somewhere around the time Kramer and the two Russians crash the baby shower to install cable television. When he wakes up from that long nap, his room is comfortably floating in darkness and he realizes with a start that his throat has dried up in a manner he is certain he has never experienced before. Walking up to the kitchen to fill his bottle and possibly make a cup of coffee, he sees his flatmates, the duo from inside the master bedroom, seated on the sofa, surrounded by a bunch of friends. One of the two looks up at him and smiles awkwardly. “This is Johnathan,” he says as all the friends, save one, reluctantly lift their heads up from the laptop screen they are busy staring into and look at him. For a second, he is certain he has seen their eyes widen up in surprise, but quickly enough they have masked it all with a cordial smile and an incoherent Hi, that leaves him with no other option but to smile back and utter a “Hi” of his own. “Would you like to have some samosas”, one of the girls lifts a half full plate out of nowhere and thrusts it in his direction. He is taken aback at the sudden offer, debating on his answer. He is only vaguely aware of what a samosa is and has absolutely no intentions of wanting to taste one and yet a straightforward refusal seems like a rude thing to do, even if to a girl he has just met. “Oh I don’t think he will want it. He is quite the health conscious guy you know,” his other flatmate comes to his rescue just then and he casts a grateful smile in his direction, even if annoyed by the possibility of the ‘health conscious’ bit being a jibe. “Why don’t you come and join us then? We were about to watch Indiana Jones and the temple of doom,” the girl says, putting the plate down on her lap, her eyes rounded up in anticipation, her manner genuinely pleasing. The others join in too and the next thing he knows, he is with them all, watching his flatmate drag the cursor backwards till the snow capped Paramount mountain peak circled by stars having had its moment of glory, recedes to give way to a movie he had so diligently avoided all this while. “So you are from China?” It takes him a few seconds to register this question from the samosa girl, the plate still in her lap and now empty. “I did not know there was a difference between the two,” the girl interrupts. “There is a lot of difference, but what I am saying is I am not from China, I am now a citizen of Canada,” he responds, but already beginning to get annoyed. The girl smiles at him, as if she has just made a startling discovery. He notices her features for the first time. She has a bad complexion and one of her incisors has a considerable part of it chipped off. If he would see her on a street, he would barely notice her. “From a colleague… Excuse me. I need to make a phone call,” he doesn’t wait to be excused, already on his feet and rushing towards his room, but suddenly remembering that his throat is still sore and parched up. He couldn’t possibly tell Jenna why the girl’s practical query had offended him. He couldn’t tell her how he had spent that night and the next day sulking, keeping to himself, trying to avoid any encounters with the flatmates. “I visited a friend Jenna,” he says at last as Jenna nods, her eyes already distracted by the trailer, that is haphazardly trying to change lanes. ‘Li Wei Han’, her name plate reads, and right below it is a picture of a bony child, about an year old. He cannot quite ascertain the baby’s gender, but he likes staring at that picture, trying to find a resemblance with its mother’s face. He often sees Li Wei near the pantry area during the lunch hour, as both of them queue up near the microwave with their lunch boxes. He sees her talking to other women on the floor, but never to him. Some times he is worried that she hasn’t even registered his presence yet. His team members are all men in possibly their 50s, cordial and pleasantly interesting. Yet, he prefers lunching at his desk as opposed to joining them in the cafeteria at a crowded hour. Li Wei, he knows has a lunch group of her own, a baby-faced man and two middle-aged women with adorable accents. Every time he sees them all together, he thinks of his friends in university, boys and girls he had never thought he could ever miss but always does. And yet, the last time he spoke to his best friend Matt was a good two weeks ago. It was through Matt’s girlfriend Mona that he had first come to know of Mr Suri’s housing arrangements. The prospects of the arrangements, of not having to rent a house all on his own, of getting over the handicap of not being able to drive and most importantly not having to pay the energy and other bills, were instantly attractive. He had sent out a mail, and Mr Suri’s prompt and extremely genial reply had also made the arrangement practical. At his work desk, he thinks of ways in which he can initiate a conversation with Li Wei. Maybe he could make a casual mention about of the company’s sudden decision to not provide green tea bags in the pantry or probably pass a fleeting comment about her baby and tell her how the child reminds him of his own niece, or would that be too intimate a conversation-starter? Since when did something as mundane as a conversation become so difficult to initiate? He looks away, as if embarrassed with his newly discovered inadequacy, and gets his attention back on the code page on his computer monitor. Lie Wei is warming lasagne in the pantry when he sees her next. It isn’t lunchtime yet, but the manner in which she is pacing near the buzzing microwave makes it evident that she is very hungry. He looks down at the lunchbox in his own hands, pleasantly pleased with the coincidence. He wishes he could say something to acknowledge that coincidence, instead he stands a few feet away from her pacing form, focusing on the lone blue vein on her ankle. He is only vaguely aware of hearing these words, let alone think of the possibility that they could be addressed to him. When he does realize and looks up, almost dropping the box in his hand, Li Wei is busy staring at him, a faraway smile on her face. “Yes, I skipped breakfast today, and it’s kind of cold too,” he responds, wishing she’d look away. He waits for a response from her side, but Li Wei is already opening the microwave, her attention cruelly back on the lasagne. Li Wei turns around that very instant, that faraway smile back on her face. “No, don’t bother,” she waves her hand off and walks away from there, even as he is unable to decide if he has offended her or amused her. Back at his desk though, he is no longer thinking. Somehow either of those possibilities don’t affect him as much as he would have liked them to. Jenna turns up on time that evening. He is annoyed, for his work isn’t done yet, and he had been banking on these quiet evening minutes to get through the most complicated of his tasks. He wonders if he should call Jenna and tell her that he would need a few more minutes, but on second thoughts he decides against doing that. Once he gets into the van, Jenna greets him with a wave of her hand. She is engrossed in a conversation with the only female commuter, one he thinks he can easily recognize, and yet will not be acknowledge outside the confines of that van. He looks at the back of her head, noticing the pearl drops hanging from her ear, wishing he could pluck them off. It takes another 10 minutes for Jenna to start the van and pull out onto the main road. Raj and the other man responsible for the delay have already apologized, saying they were in the middle of meetings that could not be left midway. Jenna mutters something, but he knows the men have been excused, and this would not be the last time one person would delay the rest. Somewhere on the interstate, Jenna switches off her music player, on which she plays ‘Christian pop’, as he likes to think of them, unbelievably infectious songs revolving around God and his awesomeness. He enjoys listening to them, as he enjoys listening to the sound of rain from inside his room, pleasant and hopeful in some strange way, and yet transient. The sudden silence is soon taken over by the sounds of Jenna’s conversation with the girl, which he realizes was the reason the CD player was switched off. He listens to the two women talk about their food habits, the younger one whose name on multiple hearings, he has deduced to be is Nazareen – they haven’t officially been introduced – tells she does not eat out in restaurants because she only eats halal meat. He isn’t sure what halal meat means, but just then Jenna say something about kosher, and it’s easy for him to make the connection. He listens to their conversations for a little longer, but soon it drifts onto more personal matters like religion and belief, and Islam, and prayers. He looks out of the window and watches the vehicles on the next lane pass Jenna’s van. He knows Jenna refuses to cross the 60mph speed limit on interstates, and prefers to drive in the left and center lanes only. He finds that deliberate slowness amusing, but in a way he has come to enjoy the predictable comfort it offers. “Hey Jenna and Nusreen, we guys were planning to go to a new restaurant for dinner today. It’s in Edison. Would you two want to join,” It is Raj, hanging up on his call earlier than usual. Nusreen refuses, and the way she does that makes him want to think that it is not just halal meat that is stopping her from accepting that invitation. Jenna though interested, politely declines, citing other plans for the evening. Jenna despite her plans, offers to drive them to Edison, and he is surprised at how easily the men accept that offer, and don’t even show much gratitude. Somewhere on the way, he thinks if he should feign a headache, and ask Jenna to drop him somewhere near the White Castle bus point, but by the time the thought fully develops, Raj taps him on his shoulder once again, his face flushed with genuine warmth. He opens his mouth to tell him of his headache, but Raj is still smiling. He nods. Maybe, a restaurant dinner would be good, and once he would get home, he’d call Matt and give him long and vivid descriptions of this new fantastic life he is thrown in the midst of! The restaurant named a curious “Shang” is situated at the end of a lane with two other restaurants all with similar structures and color schemes, and named, “Shera” and “Shahd”. “Shang” at 7 in the evening is fully unoccupied, and the maitre-d’, a charming young Indian woman directs them all to a corner table for 6. He watches the lantern-like light bulbs hanging atop each table, their dull golden glow more distracting than soothing. The walls are painted in posters with dragons in various shapes and sizes, and bordered by letters and symbols from the Chinese alphabet. The menu card is brimmed with bizarre names like Paneer chilly and mushroom manchurian, names that he knows would not be seen or heard of anywhere in China. A smile forces itself onto his face, as he realizes the irony. Chinese, Indian, Indian Chinese? Raj and the men, though trying hard to include him in their conversations drift into long stretches of words uttered in their local language, before abruptly switching to English, and passing embarrassed glances in his direction. He wants to tell them that he clearly does not mind, but instead he pretends to keep himself distant, responding only in nods and curt smiles, as if none of the 6 people on the table know why exactly they are all together at that instant. He looks around and spots three people seated on the next table. Two men, Indian; he sees them for only as long as his gaze shifts onto the woman with them, a seemingly middle-aged woman with wild red curls that seem to make her cream colored complexion look like it is set afire. He decides she is the most attractive that-aged woman he has ever seen. “Johnathan, man, who are you looking at,” Raj says in a sudden singsong voice, and then follows his gaze with such flawlessness that he can do nothing to stop that strange sense of camaraderie that seems to be threatening to erupt out of nowhere. It takes him a few seconds to recollect that made-up word, and then its meaning, but the way Raj pronounces it, and then breaks it down, his accented voice giving the word more goofiness than sleaze, makes him smile, a smile that Raj probably misconstrues, for the next second, he whistles at the woman, loud enough for the woman to finally spot them both. Raj holds onto her gaze now, and nudges him. Before he can shrug off that nudge and Raj’s overenthusiastic overtures, the two men sitting with the woman turn around. “Any problem,” one of them says, before launching into an angry tirade in a language that he is certain is not the one Raj often speaks in. And yet, now Raj responds, in English, his voice sounding unfamiliar, chilling. By this time, the second man from the other table has turned around too. He says something, and Raj responds to him, this time not in English, and standing up from his chair. He gets us from his chair, suddenly exhausted and bored, wishing the red-haired woman, her aggressive companions, and Raj, would all just disappear. “Please, stop, stop. It’s nothing,” he says, passing careful glances over the woman, companion 1, and companion 2, one by one. But the two men are in no mood to listen, for one of the them, the one who has been standing but silent nonetheless, walks upto him, an expression of incredulity on his face. For a second, he is taken aback at the command in that voice, the way the man has modulated his words, but soon the boredom and exhaustion returns as he shrugs his shoulders, and brings his palms together, intertwining their fingers with each other. “Please get back to your dinner and let us get back on ours. Don’t you think you are over-reacting,” this time he looks at the woman, almost challenging her to defy him. “Stop it Johnathan. Why? Don’t let these bastards bully you.” Before he can stop Raj, he is already walking towards companion 2, possibly to hit him or just make matters worse? He lunges further, but companion 2 is already onto Raj, and companion 1, towards him, his eyes now he can now clearly see, bloodshot, and unforgiving. Companion 1 holds him by his collar and punches him on his left cheek, so hard, he sees darkness before his eyes for a while. He pushes the man away, and not waiting to acknowledge or resist the angry sounds from Raj and his other van-mates, and ignoring the concerned and confused glances cast in his direction by the other people in the restaurant, rushes towards the door, and out on the road. 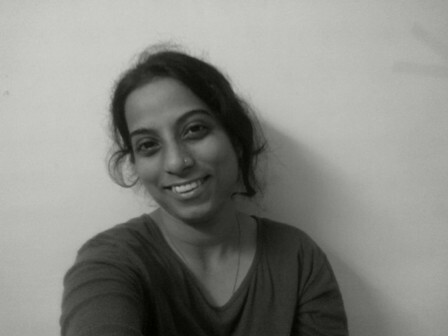 Author’s Bio: Prashila Naik is a technologist and writer, currently based out of Bangalore, India. Her work has been published or is forthcoming in various Indian and international literary magazines, Muse India, Bewildering Stories, Papercuts, Bombay Literary Magazine, to name a few, as well as dailies from her home state of Goa, India.